Habit at Hui Noeau Makawao, Maui, Hawaii (USA). May 30, 2012. Habitat: Grows mainly on the sea shore in thickets on hillsides and in sparse forests. Rainfall is high with 2000-2200 mm per annum. Most of that falls in the late spring, summer, and autumn, particularly during the monsoon season. Autumn are drier and often sunny, but by December skies grow cloudy, rainfall drops considerably, and temperatures cool down. Cycas revoluta var. brevifrons Miq. Cycas revoluta f. cristata hort. Cycas revoluta var. planifolia Miq. Cycas revoluta var. prolifera Siebold & Zucc. 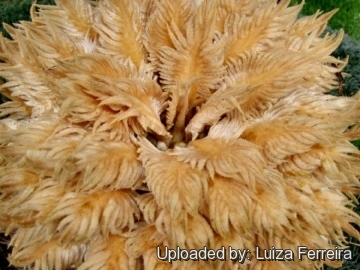 Description: Cycas revoluta is a low growing single trucked cycad, topped with whorled feathery leaves. Eventually, offsets begin to grow at the base of mature specimen, and occasionally in the crown producing multiple heads of leaves. The specific epithet “revoluta” refers to the the revolute (curled back) nature of the leaflets; the edges roll under the leaflet. Younger plants look like ferns with rosette of leaves coming from a stem near the ground. 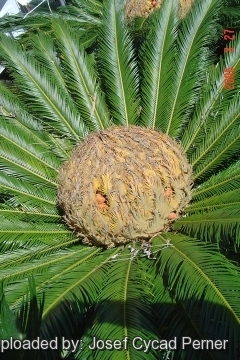 This is the most widely cultivated of the cycads. Stem (trunk): Upright, rough and retaing the old leaf bases of previous leaves, about 20-25 cm across, and usually 1,5-3 m high, however older specimens may develop a trunk or up to 6 m tall. Leaves: Long-lived, feather like growing in a circular pattern at top of trunk, 1-pinnately divided up to 90 cm long (or longer if not grown in full sun), leaflets narrow, with a sunken midrib and the margins rolled downward very dark glossy green or dark olive green, stiff and pointed, and about 10 cm long. 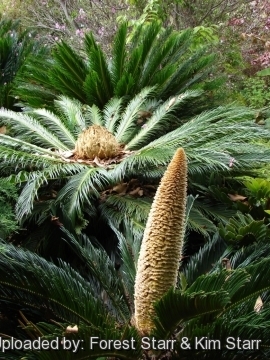 The basal leaflets are gradually reduced to spines (whereas the similar Cycas circinalis does not have spines at the leaf base). It produce a periodic "flush" of new leaves, called a "break". Flowers: Dioecious; reproductive clusters around frond bases. Female inflorescense: The female cone is cabbage-shaped, gold or tan-yellow in colour borne on small whitish miniature feather like modified leaves called macrosporophylls. It will slowly open up when receptive to pollen and later forms a tightly packed seed head. 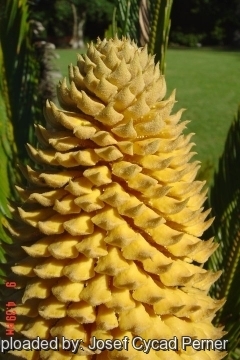 Male inflorescence (cones): Large and erect, pineapple shaped. 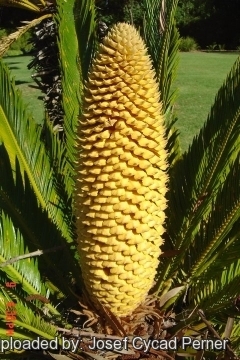 Blooming season: Females and male specimens produce "cones" in May when it is time to pollinate. Wind, bees, or other insects can pollinate the plants. 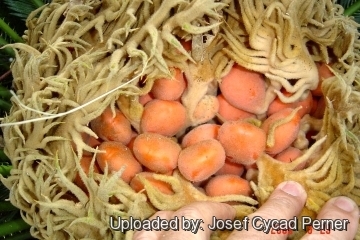 Seeds: Large, plum-like, pale yellow-tan to orange, about 3 cm across. Seed develop over the summer and are ready to be removed in January or February. A female plant cannot produce viable, fertile seed unless it is pollinated. 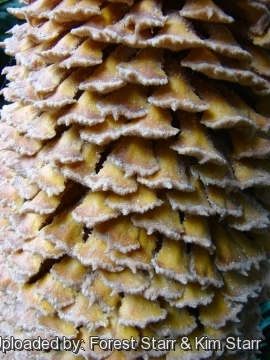 Remarks: Cycas revoluta usually known as the "Sago Palm" is actually related to conifer and Ginko trees and is one of the most primitive living seed plants (a living fossil). Cycads have changed very little in the last 200 million years. Fossils have been found on almost every continent on the planet. But most people don’t realize that it is not a palm at all. Cycas revoluta f. cristata hort. : crested form. 1) Wikipedia contributors. 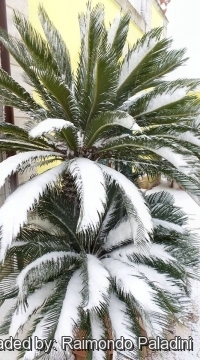 "Cycas revoluta." Wikipedia, The Free Encyclopedia. Wikipedia, The Free Encyclopedia, 6 May. 2014. Web. 29 Jul. 2014. 3) Hill, K.D. 2010. Cycas revoluta. The “IUCN Red List of Threatened Species”. Version 2014.2. <www.iucnredlist.org>. Downloaded on 29 July 2014. 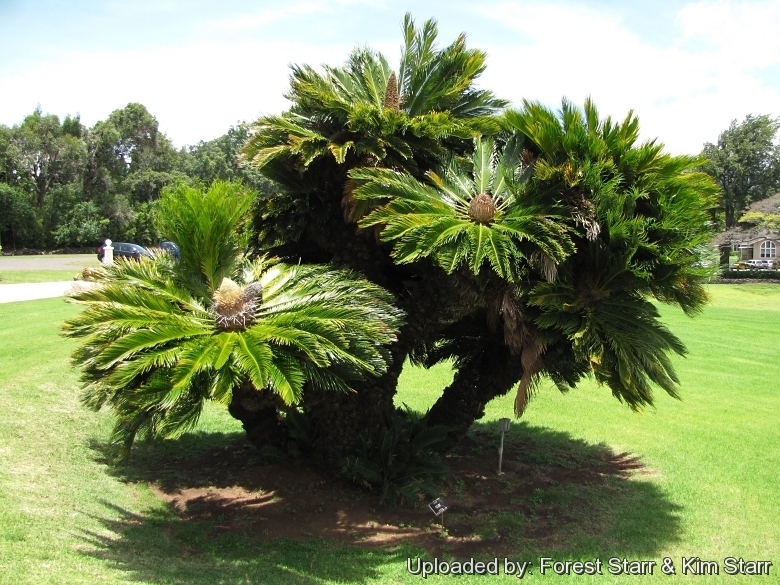 10) Forest & Kim Starr Cycas revoluta (Cycad, sago palm). Plants of Hawaii. <http://www.starrenvironmental.com>. Downloaded on 16 Sep. 2014. Cultivation and Propagation: It is easy to grow, tolerating dry periods, and light frosts. It prefers bright light exposure but colour bleaches when in full sun; best with some protection from afternoon heat. Needs a well drained spot, with deep soil, but will still thrive in less than ideal conditions, not tolerant of alkaline soils. Usually slow growing, however good conditions can speed it up considerably. Because of its growth habit, fertilize only when terminal bud begins to swell, indicating the start of the annual growth cycle. Warning: Best kept away from paths, since the leaves are quite stiff. The plants contain alkaloids of carcinogens and also an amino-acid that causes chronic nervous disorders. Regular consumption of the plant leads to severe health problems and death. Poisonous Parts: Fleshy seeds, leaves, unprocessed flour from stem pith. Symptoms: Vomiting, diarrhea, headache, dizziness, seizures. Edibility: Processed flour, toxic if large quantities eaten.